Oh. My. Word. x___x I might just have to after seeing this... Imo, Wolf's Rain definitely has some of the best images of any series of late. Thanks so much for scanning this! This artwork is amazing!! I really like how the wolf behind him is sort of sketch like. It defines both of them and makes for a pleasing composition. Thanks for sharing! i like the look on Kibas face it makes him look determined and i also like the wolfs fur. There's an Art book? I MUST have it! This is a really cool scan. I loved this series because it's awesome and Wolves are my favorite animals. What a great anime image of Kiba!!!! It has his both human & wolf forms!!! I really NEED to have this art-book!!! Kiba is soooooooooooooo kakoii and beautiful!!!!! 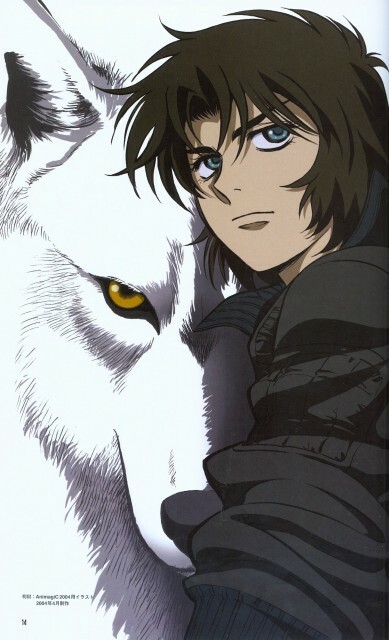 wolf rain is one of the most uniqe series - such a great story! Cool it shows his wolf and his human form. Kiba looks soo cute *-* Thanks for sharing. kiba looks cool here :D omnomnom!